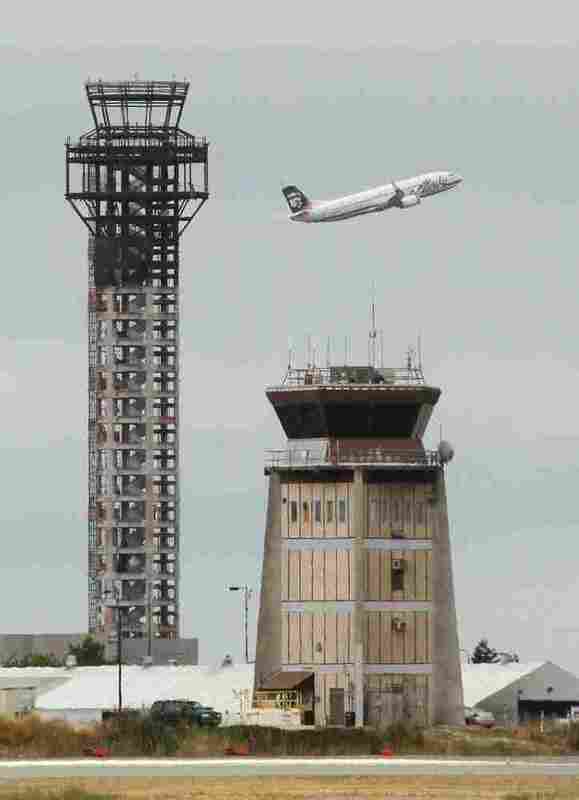 Construction crews at a new air traffic control tower at Oakland International Airport were told on July 19 to stop working after the U.S. House refused to reauthorize routine funding of the Federal Aviation Administration. Construction projects at airports around the country have stopped and 4,000 employees of the Federal Aviation Administration are furloughed, all because Congress couldn't agree on an extension of the agency's authority to operate. Democratic Sen. Jay Rockefeller, who chairs the subcommittee that oversees the FAA, indicates he will offer a plan as soon as Monday night to end the shutdown. Rockefeller's plan includes cuts in air service subsidies to some rural communities. Those subsidies keep commercial aviation service in rural areas that would otherwise be isolated. On an average Monday at the Bradford Regional Airport in rural northwestern Pennsylvania, six passengers are flying in on each of the three Continental Connection flights. About an equal number are flying out to Cleveland, where the flights originate, airport manager Tom Frungillo says. To help keep Continental from losing money on the service, the federal government subsidizes these flights at a cost of about $1 million a year. It's part of the Essential Air Service program, which subsidizes commercial flights to about 150 rural airports nationwide, at a yearly cost of nearly $200 million. Critics call the program the poster child for wasteful government spending. "Some of the flights, the airlines are flying planes as small as eight seats, and sometimes those aren't even full," says Erich Zimmermann, senior policy analyst at Taxpayers for Common Sense. He says in some cases, flying those half-empty planes can cost taxpayers quite a bit. "I think the largest is an airport in Nevada, where each passenger is subsidized to the tune of $3,700 every time they step on the plane to take one of these flights," Zimmermann says. Rural Air Program: A Waste Or Essential? Several of the tiny airports getting subsidized air service are less than a two-hour drive from a medium or large hub airport, he says. Zimmermann and others are calling on Congress to eliminate the Essential Air Service program. House Republicans took a step in that direction. In a bill to extend the FAA's authority to operate, 13 airports were cut out of the program, including those that are less than 90 miles from a hub airport and those getting subsidies exceeding more than $1,000 per passenger. Supporters say the Essential Air Service is critical to the economic development of rural areas. While Bradford, Pa., is just under 90 miles from Buffalo, N.Y., it's not an easy drive — especially when it snows, Frungillo says. "We're a community in northwestern Pennsylvania, with very harsh winters, very mountainous terrain, and we have no interstate access," he says. Frungillo says demand for the flights is starting to rise as energy companies expand oil and natural gas development operations in western Pennsylvania. The airport might soon be able to offer commercial service without subsidies, he says, as it did for 53 years before the Sept. 11 terrorist attacks. Republican Rep. Glenn Thompson's rural Pennsylvania district includes the Bradford airport and another on the list to be cut. He says he's as fiscally conservative as anyone, but he insists these subsidies give taxpayers a good return on the investment. "If you believe that the federal government has a role in interstate transportation, that's not just roads, that's also air travel. So I obviously disagree with the individuals who do not support rural America, and do not support rural airports. Under their philosophy, maybe we shouldn't even be paving roads in rural America, because there are fewer people that drive on them," Thompson says. Cutting the Essential Air Service subsidies to those 13 airports would have saved about $16 million a year, he says. But with the FAA unable to collect airline ticket taxes during this shutdown, the government is losing almost twice that — $30 million — every day. The entire amount of revenue lost during the FAA shutdown so far is $200 million and counting. That's more than the entire rural air service program costs in a year.